We’ve created a new Free EP as part of our contribution to Piano Day this year. The EP is called ‘Pairs’ and is available for free download from Bandcamp and Soundcloud from 29th March. It is also available to stream on Spotify and if you’re feeling crazy you could even buy it on iTunes. 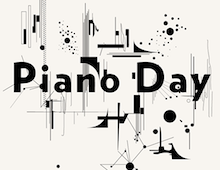 Piano Day, a annual worldwide event founded by a group of likeminded people, takes place on the 88th day of the year – in 2017 it’s the 29th March – because of the number of keys on the instrument being celebrated.